In this interview, New York based artist Fred Wilson discusses his work and the complex relations it suggests with Ancient Egypt’s iconographic and formal repertoire, popular culture, African American identity, and the relation between Egypt and Sub-Saharan Africa. By focusing on the institutional space of the museum as a medium, Fred Wilson’s work encourages the viewer to see and understand unexamined assumptions about power, place, privilege, cultural heritage, and how they shape or construct dominant narratives. Wilson’s conceptual artworks propose to re-arrange, re-examine and focus light on the invisible corners, characters and stories of institutions. Karima Boudou: To start the interview, I want to speak with you about your trajectory and background. What did you do before spending your time as an artist in New York City? Fred Wilson: Actually I am from New York City, born and raised, as were both my parents. My father was African American from Harlem, his parents were from North Carolina and Missouri originally, and my mother was from Brooklyn and her parents were from the Caribbean. I grew up in New York City in the Bronx and in Brooklyn, and also Westchester, the adjacent suburb. I was always interested in art. My mother was an educator and art teacher and my father was a civil engineer, so I have various interests through them. I got more of the artistic genes than the engineering genes. However, my father was analytical and also very philosophical, so I think I get my investigative and contemplative side from him. My father traveled a lot for work, in countries such as Saudi Arabia, Pakistan and Egypt. I visited him in Egypt, and traveled to Europe and West Africa when I was in college, so at a fairly young age I had influences from different places. I think from living in all these different environments even in the New York City area and being a person of color, being African American, people respond to you in different ways depending on what they think you are or what they know you think you are. It doesn’t matter if they are black, white, Caribbean, Latino, European or from anywhere in the world; people look at you, create an opinion or judgement about you and decide who you are. From my background in the U.S. and from traveling to different locations, I am who I am wherever I am in the world, but I realize how I am seen is through other people’s lenses - and it’s always different. I think that this fact was, and is, very influential on the way I work and how I think about work and art. KB: Since your groundbreaking project Mining the Museum in 1992 at the Maryland Historical Society in the United States, you have been working in a number of projects in museum- contexts across continents. Do you think all these museum experiences have changed the way you look at Mining the Museum today in relation to how context determines the meaning in a museum? FW: I don’t think I do. I spent a year working on that project. I have never had the benefit of that much time to work on anything before or since. I had not as much to do back then. All of these ideas I had been thinking about with museums just all came out in my Mining the Museum project. Some people might see it differently now because times have changed, but it is amazing how that project still is incredibly relevant. People still are interested in it, so it is really thrilling. To me, I think it is a high point to start out with, it was really an important thing and it remains so. What is good about having it happen at that time is that it allowed me to get other projects as it was so well known. Mining the Museum was specific to the museum it was in, and every new project is something new, its own thing. I have said what I want to say with that project; I’ve done it, so every new experience, every new museum will bring something else. Mining the Museum is the “high water mark” that I always aspire to. However with new projects I don’t over-think it, I don’t worry about it, I just do what I do. Furthermore, I do appreciate that project, but it is really, at this point, how it is reflected back to me by other people that interests me. It is really great - the way people think about it and write about it - as time passes. How they interpret it even though it’s not around to be seen. That’s for me the greatest gift of that project although I do wish I had more photographs of it, all the details of it. I am not sure about the idea of putting it up again. On the other hand, bringing it all together as a virtual project, might be fantastic for various reasons. Re-presenting Mining the Museum would be historicizing it… which is for somebody else to do. KB: Some American rappers from your generation, such as Kool Moe Dee, used their craft through hip hop to raise awareness about their African roots prior to slavery and colonialism, using the medium of music and their lyrics to break down certain conventional relationships (for example we can think of his song “Say it Loud (African Pride)”). How do you relate to that aspect of popular culture which, I think, in the case of the generation of Kool Moe Dee tended sometimes to be more materialistic than earlier masters such as Sun Ra or Alice Coltrane? Do you have any affinity with hip hop culture as it was developing in New York at that time in the 80’s and 90’s? Were you ever interested in Ancient Egyptian Symbolism in Black American Music with figures such as KRS ONE, Erykah Badu, Sun Ra, Alice Coltrane? Did some of these references and sources of inspiration inform your work as an artist? FW: I am older than Kool Moe Dee (who was born in the 1960’s) and younger than Alice Coltrane (who was born in the 1940’s). I am in between (I was born in the 1950’s). While I love Alice Coltrane, and have experienced Sun Ra perform, I am almost embarrassed to say that I have no affinity for rap and hip hop music, and I never did. I never really listened to it and I never engaged with it. Though I really enjoyed hanging out with Jay-Z for the day when he was shooting his Picasso Baby video, which I appear in. So perhaps I need to re-evaluate my level of interest. Artists are often outsiders and in that regard I am, or was. My installations at the Cairo Biennial in Egypt and at the Whitney Biennial in New York, and also my artwork for my show called Panta Rhei at Metro Pictures, were really based on my experience in Egypt and the popular culture of the United States at that time. As you mentioned, some of these rappers’ and singers’ music and style were completely infused with ancient Egyptian iconography and history. The book Black Athena by Martin Bernal came out before I went to Egypt. I was really interested and engaged in the dialogue and how people were framing Egypt according to their interests, identities, and identity formation. Having been to Egypt and knowing Egyptians, the history of Egypt, the history of art, and the history of Europe in relation to Egypt, this new infusion of African identity vis-à-vis Egypt really intrigued and engaged me. I was an outsider taking all of these cultural influences on the subject and presenting them together. I was deeply involved with the various views on heritage and ancient Egyptian culture, but I also knew I was simply an observer. Contemporary Egypt is one thing, African American culture is another thing.There was never necessarily a dialogue between the two, but each [culture] grew with a desire to engage with that ancient history in Egypt, to a degree. Portraits of Cigar Store Owners, from Mining the Museum: An Installation by Fred Wilson, The Contemporary and Maryland Historical Society, Baltimore, 1992–1993. Folk sculpture by John Philip Yeager, c. 1870s (except fourth from left: artist unknown). KB: To move further in our discussion, and with some of the concerns of the magazine WTNOTN (in which we are interested in different forms of speculation on the relationships between Ancient Egypt and African identity and Sub-Saharan Africa), how would you describe your relation to ancient Egypt in your body of work in the last decades? Were you ever interested in Ancient Egypt, and how does it reflect in your work? Do you have a personal link with Egypt? FW: I have a very strong link to it. I haven’t been there for many years now. I wonder how my friends there are doing now. To respond to your question about my interest in Ancient Egypt, it is sort of a yes and a no. Personally I found it fascinating, but I am not part of any particular dialogue around Egypt and African American history. Of course I was always interested in the Ancient Egyptians and their relationship with Sub-Saharan Africa. Museums for a long time ignored that relationship. I tried to bring that out in my museum projects in a way that made sense to me; also because Egypt and America are so far away from each other, few in these museums really think about these things. For me, there are very interesting parallels and differences in how they frame their past depending on who is in Egypt. That was my real fascination. I continue with that theme, looking at various cultures and noticing the adjacencies, the similarities, the differences, the incongruities, the irony, and the humor…. all these things that come up if you step back and look at a cultural phenomenon. KB: Were there specific objects from that period which drew your attention at the time you visited Egypt and then afterwards? FW: I have always been interested in ruins and so perhaps it started with my first trip to Egypt. I am interested in these histories of the past that are muted, they are veiled because there is just a little bit there to understand and see. I was very engaged with the form, more precisely the aesthetics of Ancient Egyptian sculptural forms in the desert. I think what most intrigued me was not the things I thought they would be, like the pyramids and the Sphinx, but all the buildings and royal structures that are in the desert along the Nile that you really don’t hear about. Such as Edfu, Calapsha, and Philae Island. At the time, no tourists had been to Philae Island, and I happened to be around when Jacques Cousteau’s son, Jean-Michel, was going on an expedition. I got to go on the boat with them to see this island that nobody had ever seen. I was very young and very interested and excited to go, so I guess they just thought, “Come along!” I also was very interested in Anubis, the image of Anubis and the history of it. I was engaged with the specific sculptures, but even more inspiring were the spatial environments where the temples were, and how images and objects related to one another. This really intrigued me. I made photographs of some of these sites and they still influence my thinking, if not directly visible in the artwork. KB: Do you in one sense collect objects and things that are connected to Ancient Egypt and its aesthetics? FW: It is interesting that you mention that because when I get excited about a particular topic I collect things, and I have collected many things about Egypt. I collected the majority of objects while I was in Egypt doing research for my exhibition there. It was a very difficult period in Egypt. There were very few tourists. I remember that for my project at the Cairo Biennial and the Whitney Biennial I bought all this stuff from various tourists and antique shops. I bought a huge number of things from one particular shop in one day. The shop owner was so thrilled he brought out his prayer rug and just prayed... I am very happy when I can support the local economy in some way; to give something back for all that I have received from the citizens’ hospitality and friendship.Now I have moved on to different subjects other than Egypt, but if there is something that I see that inspires me, I will buy it and collect it. However, Egypt is not a constant for me anymore. KB: It seems to me that this aesthetic of ancient Egypt and its cultural artifacts somehow deal with a certain concept of the ideal and of beauty. The relation to both these notions and our perception of cultural artifacts, their representation and value in different times and contexts seems to somehow relate to your practice. Could you expand on that ? Furthermore, if you were to speculate about this, who do you think were the Egyptians in relation to us? FW: Right, also the value of these cultural artifacts in the American museums, or if it is in the African American interest, everyone takes a piece of it as their own. On the one hand it is the Egyptian’s culture and they are not really framing it in the same way, and certainly if they are extremely religious that ancient stuff is not particularly important to some of them. On the other hand the ancient culture and architecture is an important part of world history and the Egyptians are really proud of the fact that it is there. In my work, the forms are very important to me and also because they are very specific, so I really enjoy the difference between the two. I am also interested in Nubian culture, I unfortunately never did get to Meroe in Sudan, which at the time was easy passage, but I didn’t get to go. I would have loved to go to see the ancient Nubian ruins, but I never did. So I am very interested in those relationships between the Ancient Nubians and the contemporary Nubians, I got very involved with them trying to bring a music group from Egypt to the United States because Nubian music was not commonly known in the U.S… The great thing about traveling and going to places with such a strong ancient visual culture is that you are surrounded by it, it kind of comes into your pores. All your senses get affected by it. I had a very strong experience with the ancient world there. This question of who the ancient Egyptians were racially was also very intriguing and I am trying to understand not necessarily my own position on it, but everybody else’s position on it, and how that has changed over the years. These things that I am mentioning also come up in my work. 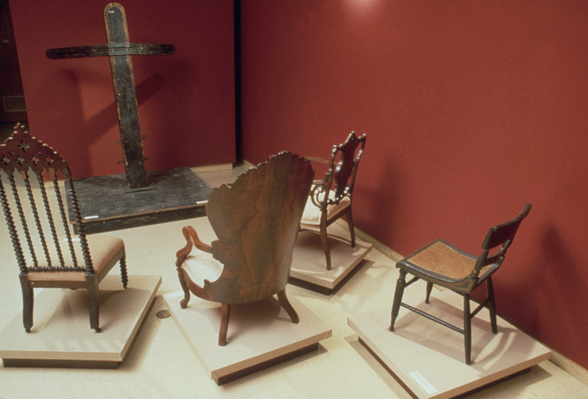 KB: In 1993, you participated in Whitney Biennial in New York with an installation entitled Re:Claiming Egypt. Was it the first time you presented that body of work in the United States? How do you think the audience of the Whitney reacted to your work in the context of this biennial of ‘American Art’? FW: Well, I had done the Egyptian project of the same name in Egypt in the Cairo Biennial. It looked different. I took the white-walled art space in Cairo and returned it to looking like its original environment, a Pasha’s Palace with it’s green walls and gold decorative molding. I bought Egyptian tourist artifacts and copies of 19th century European furniture to complete the transformation. There was a music video of Michael Jackson dressed as King Tutankhamun, and other African Americans in fantasy versions of ancient Egyptian style dress enacting their versions of ancient Egyptian dance combined with contemporary music-video dance movements. 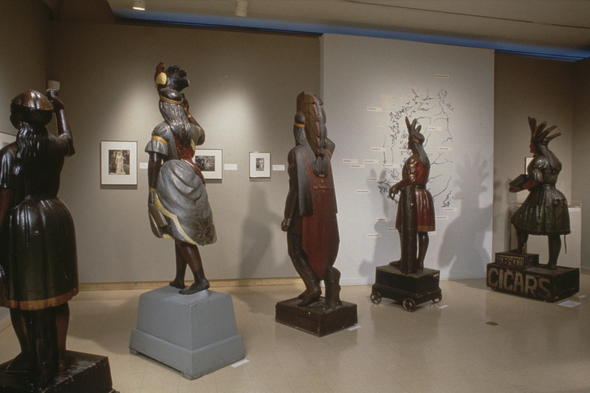 In the Whitney, the project was looking at the Western museum and its relationship to Egypt. Those two projects were the first time I showed this kind of work in the United States. In a previous exhibition that I did in 1992 at Metro Pictures in New York, I displayed copies of Egyptian artifacts and Ancient Greco-Roman artifacts. I was very interested at the time in the book Black Athena. For classical historians this aspect is not unknown to them, they do not talk about it much, but it is not unknown to them that the ancient Greek gods had Egyptian deities as predecessors. So I created a sculpture that brought together the body of Artemis and the head of Bast, the Egyptian cat god. They are directly related historically. This project in a light blue room, brought together in “assemblage” plaster sculptures of white Greco-Roman deity figures and black figures of Egyptian Gods. Again, when you think about these relationships historically, there was obviously a relationship between the two cultures; Greece and Egypt were so close to each other, geographically. KB: Could you tell us more about the installation at the Whitney Biennial and how was it articulated through the works that composed it? FW: Yes it was an installation of works, displayed like a classic European or American museum’s gallery of Egyptian art and artifacts. The works that I did depended on the objects that I bought or had on hand. I collected things that I thought reflected our relationship to Egypt, but also the relationship of museum culture to Egypt. At the Whitney Biennial, I used tourist souvenirs in the form of ancient Egyptian artifacts and combined them with African American, Egyptian themed tee shirts, among other things. I also used a Metropolitan Museum video on ancient Egypt and collaged it with the Michael Jackson video. This comes in line with our discussion about these Western, African American and Egyptian ideas - how they clash, and their relevance vis-à-vis class and different cultures. The year 1992 was the zenith of my working in that way. Once I feel that I have embodied the subject, I move on to something else. KB: So is it also something you will continuously come back to in your work? FW: I never say never to something, because you never know. 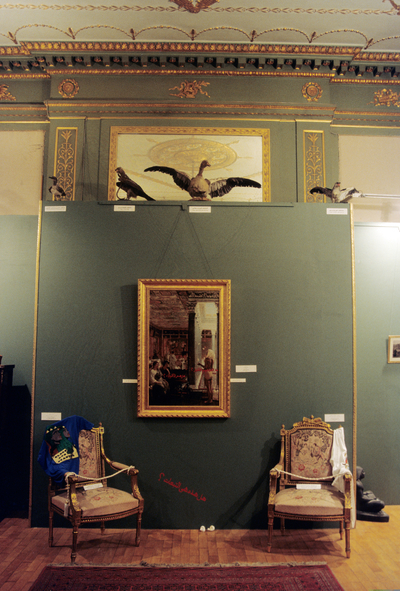 In 1997 I created an installation at the British Museum with the empty display boxes, etc, used originally to display Egyptian artifacts, including the Rosetta Stone. I thought I was over with it after that, and then in 2006, I saw two sculptures, one in an antique store and one in a plaster cast studio. I just realized then that I had to juxtapose them together. This is something I showed in my most recent show at the Pace Gallery in New York. I made a large bronze work out of them which compares and contrasts a classical sculpture of a European woman with an ancient sculpture of an Egyptian queen. The work is called The Mete of the Muse. As I said these things are in you, once they are in you they will come out again. I am off to other topics but again… who knows. KB: Coming back to this exhibition you participated in at the Whitney Biennial, you have worked on museum education in the past. How did the audience react to Re:Claiming Egypt in this context ? FW: It was a controversial biennial which was loved and hated at the same time. A lot of artists who were working at that time were showing their work in a lot of alternative galleries, but not in commercial galleries. The Whitney Biennial prior to that time had mostly been gathering artists from commercial galleries. In this edition of the Biennial were a lot of outsiders and also there was almost no painting in the exhibition. This infuriated a lot of people. Furthermore, “political” installations dealing with social issues was important for artists at that time. So it was upsetting for a lot of people who were used to the usual biennial exhibition. Also, it was incredibly well attended; it was a very energetic and wonderful exhibition which got a lot of attention. I don’t remember any particular issues with my work during that show; I think it was a very current topic that I was dealing with in my work. As Erykah Badu and these other singers you mentioned who were focusing on how they dressed and how their lyrics were in relation to Egypt, I think people were engaged with it, but I think the show itself was more controversial than the work that I did. 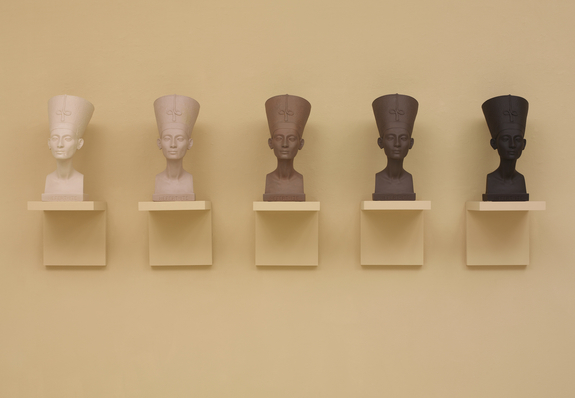 KB: I want us to expand further on this installation by focusing on one artwork which you integrated to it, titled Grey Area (Brown Version) which depicts five portrait-heads of the Egyptian queen Nefertiti. The ‘authentic’ artifact is displayed in a museum in Berlin. Firstly I would like to know how you position yourself with respect to the ‘original’ Nefertiti statue? By making 5 copies or reproductions of it , and setting up a value scale ranging in color from oatmeal to dark chocolate, what did you want to point to? How do you tackle the notion of “hybridization” in the work Grey Area (Brown Version) and in your practice in general? FW: “Hybridization” is sort of who I am. My lineage is all over the map, so it is very fluid for me. I am not rigid and say “I won’t do this or I won’t do that.” I just do whatever is important for the artwork. Basically I bought the plaster casts of this sculpture and changed the color range. The fame of the Nefertiti statue was fascinating and fortunate for me - you can buy so many casts of the same thing.The original version of the work called Grey Area was first presented in the Whitney Biennial; now it is in the collection of the Tate in London. Grey Area (Brown Version) is in the collection of the Brooklyn Museum of Art. I was mostly looking at this notion of perception; people will look at this grouping and decide for themselves about this particular figure wondering where the original truth is. For me that is an essential question - people deciding for themselves, questioning truth, the perception of museums in different points in history. I have never seen the original, I know it is in a museum in Berlin, but I have never been to Berlin. There are even questions about the original, the original color and what it should have been. I thought it was a fascinating topic and I wanted to put it out in that way for people to think about. FW: What do you think about this particular point? FW: Yes, and then people change their minds and it has already been decided by a group and it takes a long time to change. That is the difference between Europe and the United States, most of the museums are private in the United States, so unless you are in Washington DC where museums are state and government run, this issue is really different. I can imagine the political process can really force the hand of the museum in good ways, as well as in bad ways. KB: There is also this tradition in France that every President of the country will inaugurate a major cultural institution during his mandate: with François Mitterrand, it was the Pyramid in the courtyard of the Louvre, with Jacques Chirac, the Quai Branly museum, and then most recently Nicolas Sarkozy inaugurated the Palais de Tokyo in the banks of the river Seine. So this protocol falls in line with this idea of linearity, stability in the way cultural symbols align with political agendas. KB: In 1827, linguist Jean-François Champollion who is known for solving the enigma of the Pharaonic writing in 1822, summed up his vision of the Musée du Louvre’s Egyptian antiquities department by stating: "I’m thrilled just thinking about what I have to show you...this interesting series of monuments that reveals the cult, the beliefs, and the public and private life of an entire people before your eyes". Besides Champollion’s Eurocentric and encyclopedic view of cultural knowledge and how the Louvre should perform, another uncanny thing is the fact that since 1997 and during the Grand Louvre renovation project, the museum had to compromise on its usual chronological display. This unexpected situation came up in the museum because the heaviest works of the collection could only be displayed on the ground floor following a thematic installation developing “the main aspects of Egyptian civilization”. Besides these institutional decisions and ‘misfortunes’, did you ever work in a museum context in France? Have you ever visited the Egyptian antiquities galleries of the Louvre ? Would you consider this in regard to your practice as a good context for mining this museum, the differences between cultures and standards of beauty? FW: This is very interesting, I’ve worked in so many museums, and they have their ideas, their plans, but then things happen and pragmatic decisions are made that have nothing to do with art, history or scholarship. In the end, their plans are not exactly the way they originally planned it. So this is a very obvious situation and example. I have never exhibited or created an installation in a museum in France, and would love to. I have shown my work several times at the Jean Gabriel Mitterrand Galerie. Usually when I travel for work I come for something specific, so I don’t get to see very much. The Quai Branly museum has some wonderful things in it and terrific temporary exhibitions, but it has a permanent installation that is quite problematic, and no one is talking about that. I really wanted to go to the Louvre when I visited, to see it again. I would like to think about that museum because it’s an important museum, but also because how they frame notions of culture and politics through display in this incredible building is fascinating. It has been a long time since I have visited the museum. I think the last time I went there was before you were born, I am sure! This interview was initially published in the magazine WTNOTN What’s The Name Of This Nation. Edited by Soufiane Ababri and Karima Boudou, published in October 2015 by Le Cube (Rabat). Special thanks to Fred Wilson, Heather Bursch and Srajana Kaikini.